The object that I want to photograph is positioned in front of the camera. Strong lamps illuminate the object. A lens in the wall of the camera projects the image of this object onto a large projection panel inside the camera. I stand inside the camera and see the image in the darkness of the camera. The size of the projection varies from 2×2 meter in Camera obscura #1 until 3,6×4,8 meter in Camera obscura #5. To focus the image I move the projection panel, which is placed on wheels for this purpose. The whole setup is maneuvered around as long as necessary to make the projected image as desired. 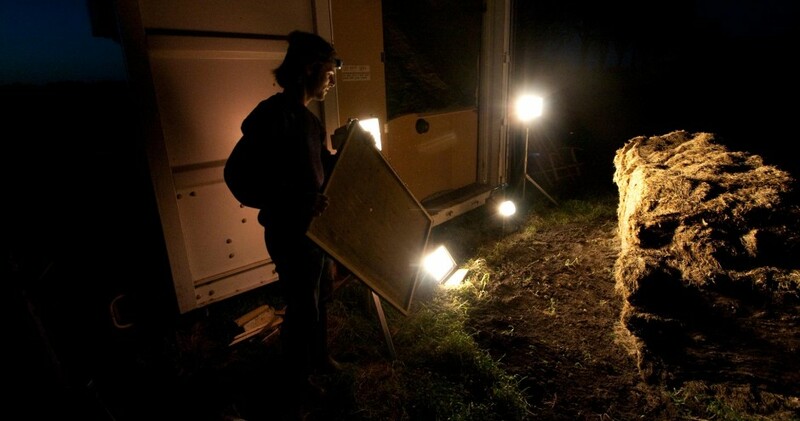 Adjustments to the object setup, lighting, lens position and angle as well as to the projection panel are made. Light is measured in many different parts of the projected image and test exposures on analog photopaper are made. After developing the tests adjustments are made to the whole setup and more test exposures made. This proces repeats ad infinitum. When the test exposures show satisfying results a full size exposure is made. A piece of analog photopaper is cut to size in absolute darkness and mounted on the projection panel.As the prints can be up to 1,4 x 3 meter big, this takes special care. The lights illuminating the object are switched on, the lens opened and so the paper is exposed. The exposure times vary from seconds to hours, depending on the setup. The exposed paper containing the so called latent image is then developed on the spot. After developing it is thoroughly rinsed and carefully dried.The work is ready. No trimming takes place since framing was done inside the camera.